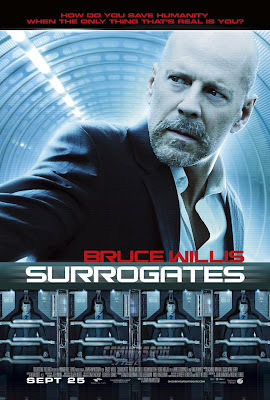 Its been weeks since the day I watched Surrogates but I didn't got the chance to review it. Not because it is not good. In fact the movie is so good that I don't think I need to review it to convince people to watch it. Bruce Willis + Comic book material = Action packed sci-fi film. With the formula nothing will go wrong. Surrogates is a movie based on a comic book written by Robert Venditti back in 2005. Basically Surrogates tells a story of a society where people is already so dependent on robotic avatars that they can control remotely from home. Almost 90% of the people walking on the streets are robots that are so perfect, that you will think it is Fashion Week Everyday. The story is good though the idea of having robots controlled remotely like avatars are not that original. Its been used several times specially on online games inspired movies, tv series and animation series. In fact the idea is also similar to the upcoming James Cameron flick Avatar. The only difference is in Avatar, alien bodies are used as remote vessels. But despite the unoriginal idea, the story concept overall is unique. It discusses social and biblical aspects of humanity that lead to an unending conflict between man and surrogates. Also the mystery of the surrogate's operator's real identity adds to the enigmatic atmosphere of the film. You will all be surprised whenever an operator's real identity is revealed. And of course with the stellar cast of Bruce Willis, Radah Mitchell, Rosamund Pike, Ving Rames and James Cromwell, the movie will surely get attention. The movie is a sci-fi thriller so I think acting is not a big deal on this film. Bruce Willis still have the moves despite the age and he still embodies the persona of a legendary action star that all of us idolize. Regardless of Jonathan Mostow's bad craft on Terminator 3: Rise of the Machines, I congratulate him for a job well done in Surrogates. This movie is a must watch specially if you are a Bruce Willis fan. Go grab your friends and watch this film. Saw this movie with my family. I give it a 4/5.